This Open House Feather Flag Sells at Very Low Price Points! Buy in Large Quantities for Additional Wholesale Savings! 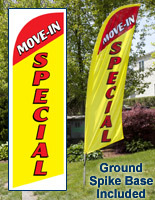 The Open House Feather Flag, also known as a Flutter Banner, Is More Effective than Just a Yard Sign! Black nylon bag for transporting the open house feather flag. 8' Tall once assembled to draw attention from all that drive by. Segmented aluminum and fiberglass pole is easy to set up and inexpensive. Open House Feather Flag - "OPEN HOUSE, WELCOME! AGENT INSIDE!" 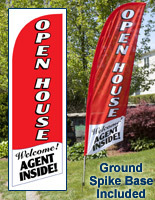 The open house feather flag, like this swooper banner, is a very effective tool for selling real estate! Why is this particular type of outdoor display so effective? 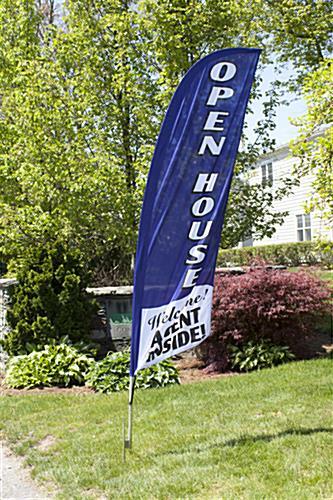 This open house feather flag that flutters in the wind has large, easy-to-read lettering and a tall height, making it simply more visibly than a traditional lawn real estate sign. Once placed on the pole, the swooper banner stands approximately 8 feet high. 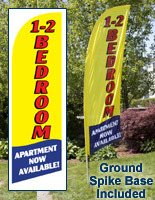 The open house feather flag that is 2 feet wide is readable in almost any weather. This feature is the result of an ultra-lightweight knitted polyester fabric that flutters in light winds. 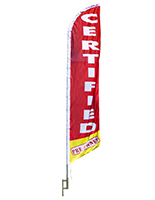 This open house feather flag that has an aluminum and fiberglass pole is much less expensive than similar outdoor displays that come with a completely fiberglass pole. A bungee cord connects the banner to the pole, pulling it taut. 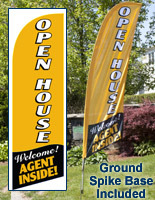 These open house feather flags have the classic blade banner shape, which is easily recognizable to the public. Yet, the practical 8' height of this display requires only one person for assembly. This outdoor advertising display is an open house feather flag for real estate. Since the unit has a message specifically for realtors, it was also designed to be highly portable so agents can use it at all their showings. The purchase of this open house feather flag includes a black carrying case made of nylon fabric. 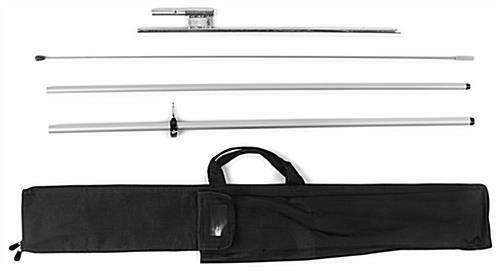 Separate compartments in the case allow realtors to store all the pole components in an organized fashion, and ensure the aluminum pieces do not clang together while in transport. 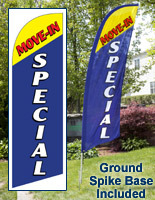 Each open house feather flag has a ground spike base for use on grassy surfaces. 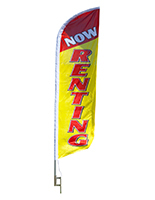 Not only is this series of swooper banners more affordable than other series, but these flutter flags also include all the convenience and user-friendly features realtors need in their advertising equipment.